Deoxit is your best solution to resolve a minor issue. Many issues are minor and fall under user maintenance. Tubes often once taken out of the sockets may need to be rearranged to obtain optimal performance in a tube unit. This is the Royal Premier, 50th Anniversary model, manufactured in 1964. 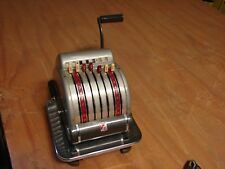 This machine is in beautiful collectible condition and is being sold as-is. 50TH ANNIVERSARY MODEL ROYAL PREMIER, W/ KEY. All proceeds are used for that purpose. (Topics: a.k.a. Check Protector / Baby Defiance Check Protector Material: Cast-Iron. Baby Defiance Check Protector. Indelible Slotted Cut. Defiance Check Protector. Indelible Slotted Cut Check Protector ). Antique Protectograph GW Todd & Co Check Protector Embosser. Shipped with USPS Priority Mail. In great condition, though key will not turn or pull out. (I tried with pliers it is stuck). Quality office item from the turn of the last century. A little plating loss but the paint and gilding are excellent. There is no key. The printer works (see photo). Great for display. Antique memorabilia and it works! I COULD NOT MOVE THE FIRST 4 LEVERS. I AM NOT FAMILIAR WITH THE OPERATION. MAYBE A TECHNIQUE NEEDED TO OPERATE. SERIES EXCEL MODEL XL3-546571 THE KEY IS MARKED H1721 MADE IN USA CHICAGO LOCK CO.
Hedman Check Writer Protector F & E Premier Royal. Possible Machine No. FREE Trial! GREAT CONDITION, ONE USER ! 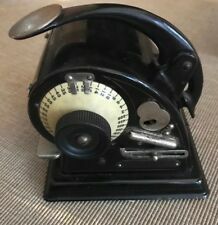 This is an antique check writer. All the numbers seem to function, the "C" clears the numbers and the handles pulls down as expected. Get Supersized Images & Free Image Hosting. Lots of age and wear, missing the top to a button, still works. VINTAGE F & E CHECK PROTECTOR HEDMAN COMPANY W/ KEY. Antique item, sold as is, key function but unsure if item works. Item is cosmetically in pretty good condition but does have some age wear. Shipped with USPS Parcel Select Ground. In great used condition and working order collectible rare serial 447852. Antique. Protector Check Writer Embosser - gorgeous! WORKING . The unit is in great condition with wear from age. There are scuffs and scratches. The numbers all seem to work and the "C" button clears the numbers which will pop back up. Other than that, functionality is unknown. 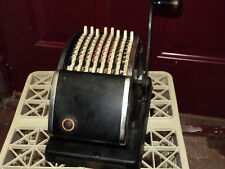 Vintage Hedman Co. F&E Series 900 Check Protector Writer Embosser . Condition is Used. Shipped with USPS Priority Mail. C.1890 Cast Iron Check Protector / Perforator by Wesley MFG. Co., New York. USA. A cast iron check perforator or protector made by Wesley MFG. Co., New York. The numbers can be chosen by turning the push down stamp, the side wheel advances the paper and fine needle like pins punch the number. Check Protector Device. Write Checks Professionally. Protect Against Forgery.